Regarded as the most sacred temple in Thailand, the Wat Phra Kaew enshrines the most revered emerald Buddha. The Wat Phra Kaew, also called the Temple of the Holy Jewel Image, is located in Phra Nakhon district, within the grounds of the Grand Palace. The Wat Phra Kaew was built during King Rama I’s reign, to be the royal family’s private place of worship. It consists of 100 buildings done in old Bangkok architectural style. The main building where the Emerald Buddha is enshrined has architecture similar to the temple in the ancient capital of Ayudhya, and the pillars of the building are decorated with an inlaid mosaic pattern and the gables are made of marble stones. 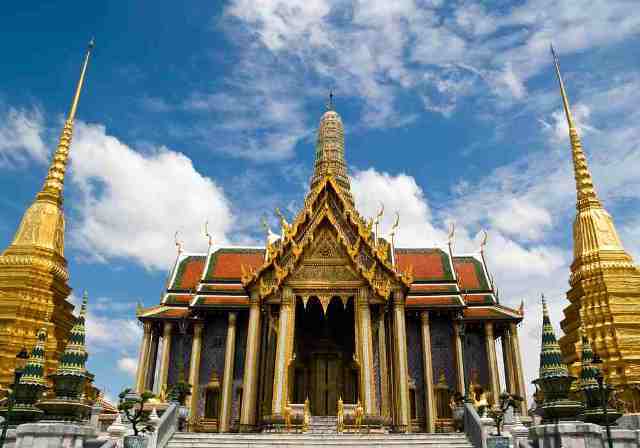 The altar where the Emerald Buddha sits is an elegantly designed high platform surrounded by decorations plated in gold. The Emerald Buddha, probably the most important Buddha image in Thailand, was so respected the Kings themselves change its robes when the season changes in an elaborate ritual and ceremony. It wears a robe richly covered in diamonds during the hot season, a solid gold robe in the cool season and a plated gold monk’s robe in rainy season. The Emerald Buddha, a small Buddha image with a dimension of about 60 centimeters only, was said to be carved from a single block of jade. The Thais call jade stones “emerald”, so the Emerald Buddha isn’t really made of emerald stone but of the semi-precious jade stone. According to popular belief, the Emerald Buddha has originated from India and was lost several times during the war, then was returned to Thailand and transferred from one temple to another until the Wat Phra Kaew finally became its ultimate home. Furthermore, in the old days, the Emerald Buddha was paraded in the streets stricken with cholera and epidemic diseases. The Thais believed that the Buddha drove away the illnesses. The practice was discontinued in King Rama IV’s reign when the king declared that those illnesses are not caused by evil spirits but by earthly factors like germs and bacteria. Nowadays, atop its high altar and with its glass casing, the Emerald Buddha isn’t so easy to get a good look at anymore. Taking photographs inside the shrine is also not allowed. And like all other temples in Thailand, visitors are expected to wear respectable clothes. For females, sleeveless blouses, short pants and short skirts are not allowed. Short pants are also not permitted in male visitors. In addition, when you set foot inside the temple, you are expected to take your shoes off. This shows that you respect not only the temple as a holy place but also the Buddhist beliefs of the locals. But propriety in clothes is not the only thing demanded of visitors, proper behavior and decorum are also appreciated. As a show of respect, you must also cross your legs when you sit down, and when you stand up, avoid pointing your feet towards the Emerald Buddha. Remember that the Wat Phra Kaew is not a tourist attraction but a place of worship for the Thai people.